Senator McCain says Obama's administration leaked a report on Obama's approval of cyber-attacks against Iran in order to win votes. 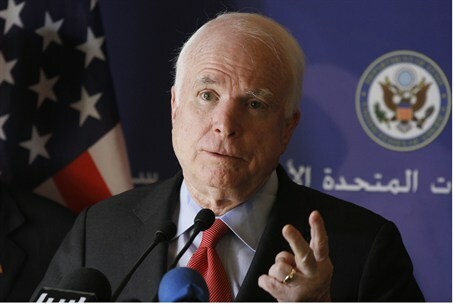 U.S. senator John McCain on the weekend accused President Barack Obama's administration of leaking the report of Obama's approval of cyber-attacks against Iran in a bid for pre-election glory. McCain also pointed to previous leaks that revealed details of last year's U.S. raid that led to the killing of Al-Qaeda leader Osama Bin Laden. He was responding to a New York Times report from Friday which said that Obama ordered the Stuxnet virus attack on Iran in 2010, as part of a wave of cyber sabotage and espionage against the would-be nuclear power. The report was based on a new book, citing senior Washington sources, which chronicles secret wars under the Obama administration. The book, “Confront and Conceal: Obama's Secret Wars and Surprising Use of American Power”, was written by David Sanger. The Stuxnet virus, aimed at the Natanz uranium enrichment facility, was designed to damage centrifuges by making covert adjustments to the machines controlling them. It was part of a “wave” of digital attacks on Iran, codenamed “Olympic Games” and was created with the assistance of a secret Israeli intelligence unit, the book says. While he admitted that the president has the authority to carry out such operations, McCain said most presidents would discuss them with a “select few leaders of Congress.” He added that the White House did not brief U.S. lawmakers about the cyber-attacks. The report on Obama’s role in the Stuxnet attack came several days after Iranian security experts reported that Flame, a virus far more dangerous than the Stuxnet worm, struck the country's computer systems. The virus, described by the Kaspersky Internet security firm as the “most sophisticated cyber-weapon yet unleashed”, struck at least 600 specific computer systems in Iran, Syria, Lebanon, Egypt, Sudan, Saudi Arabia and the Palestinian Authority.